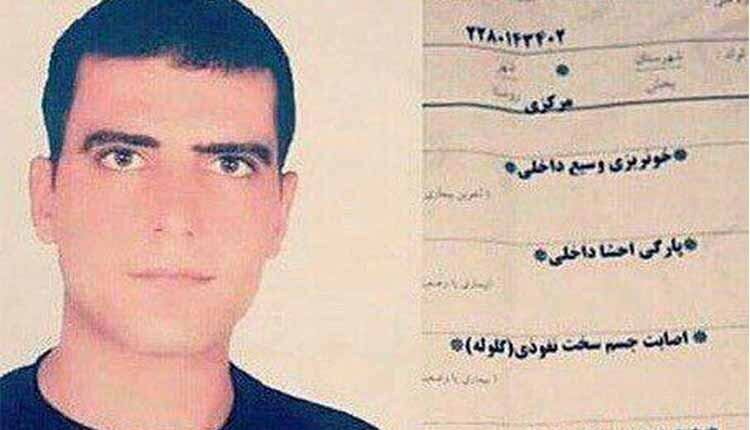 On Sunday, April 22, 2018; only a few hours after Hossein Tabe Bordbar, 28, from Shiraz was arrested in his residence by Disciplinary Forces after being severe beaten and being severely injured and transferred to another place, his family announced his death. The corner report confirms that in addition to torn internal organs three bullets have hit him. This comes at a time that there has been no shooting during the arrest and he wasn’t enough conscious to engage or ran away, due to severe bleeding. The corner office has confirmed that he has been shot from close distance into his belly and the shooting was after the detention. The family has submitted a complaint to the judicial organs. One of the family members said: “It was about 20:45 that three plain clothes of NAJA (Islamic Republic Disciplinary Force) along with a soldier from the Sheriff Office NO.12 in Shiraz’s Fakhr Abad Region raided the residence of Tabe Bordbar in a white Peguout Pars. They committed violence and asked for Mr. Bordbar’s son. He asked them for their writ but they pushed him and hit her wife in the head. They dragged Hossein out of toilet by braking the glass, hand cuffed him and hit him violently in front of his parents and neighbours, then dragged his half dead body on the ground and took him away in the car to an unknown location”. They informed his family of his dead half an hour later through Al Zahra Hospital.